And coming in May 2014, Crime Rib. When a national TV cooking show comes to Jewel Bay to film the annual Grill-Off, things get hot. Can Erin find a killer–before the town’s reputation is toast? Thanks again for sharing my excitement — it means the world to me! 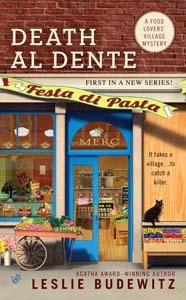 This entry was posted in Food Lovers' Village Mysteries and tagged Carolyn Hart, Death al Dente, Food Lovers Village Mysteries, Hank Phillipi Ryan, Laura Childs, Sofie Kelly by Leslie Budewitz. Bookmark the permalink.